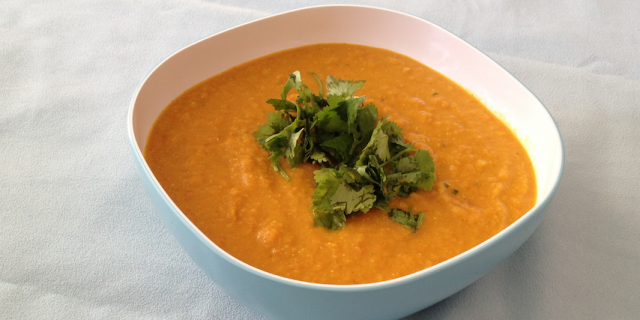 This Red Lentil Coconut Soup is yet another great lentil dish. I like to have a big meal for lunch and a lighter meal for dinner and this makes a perfect light dinner. The spices used in this dish not only enhance the taste of this soup, but also make it more nutritious and balancing. If you are prone to gas or bloating, adding the right spices can make a world of difference. Fresh ginger and many of the spices used in curry powder such as cumin, coriander and black pepper help to reduce any of the side effects that legumes are often associated with. Red lentils are super healthy. Rich in dietary fiber, iron, folate and magnesium, they give energy, help stabilise blood and support heart health. Find out more about the health benefits of lentils here. Rinse the lentils thoroughly and cook for 30 minutes in a large pot. Skim of the foam during cooking. You can also add the lentils at step 4 but I prefer to cook them separately so you can do get the foam that usually comes with cooking beans in the dish. In a large saucepan heat coconut oil and add the onion and cook for 2-3 minutes, followed by the carrots, ginger and garlic. Cook, while stirring, for another 2 minutes. Add the chili powder, yellow curry powder and cinnamon and cook for 2 more minutes. Add the baby tomatoes and cook for 2-3 minutes or until soft. Add stock, coconut milk, lentils and coconut sugar and cook for 20 more minutes. When ready, use a hand-held blender to create a smooth texture. Season with Himalaya salt an serve with a sprinkle of fresh lemon juice and fresh cilantro. One Response to "Red Lentil Coconut Soup"